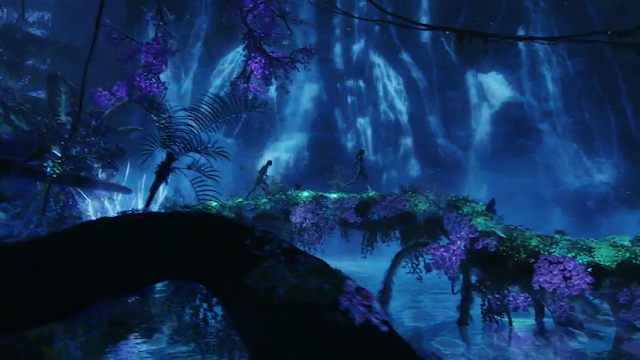 The language of the Na'vi is a hauntingly beautiful thing, constructed by master linguist Paul Frommer of USC. He based it off of 30 or so character, place and creature names provided by Cameron and Co. They had some Polynesian/Maori influence because of the time Cameron has spent in New Zealond and similar places. So Frommer used Polynesian roots, with some African, Native American and Latin influences, all mixed up with German sentence construction, where the verb comes last. Frommer's next step was to create a sound system, a palette of consonant and vowel sounds in various combinations that would be unique to the Na'vi. "It's not based on any particular human language," Frommer said, "as the Na'vi live light-years away from earth and are humanoids, not humans." Klingon, the full-fledged language developed for the fictional warrior race in the Star Trek universe, explains Frommer, is currently the gold standard by which all constructed alien languages are compared. There's a Klingon dictionary and even Hamlet has been translated into Klingonese. But while Klingon is rough-sounding, Frommer intended his language, which is spoken by the Na'vi, the humanoid race who live on Pandora, where the action of Avatar takes place, to be "musical and mellifluous." 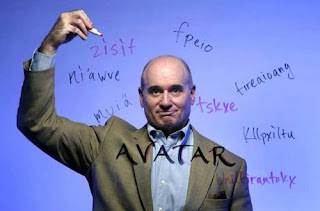 Frommer began working with Cameron on the language in the summer of 2005, after representatives from Cameron's production company Lightstorm Entertainment, emailed USC's linguistics department, where Frommer received his Ph.D., about developing an alien language. Linguistics professor Edward Finegan, with whom Frommer wrote Looking at Languages: A Workbook in Elementary Linguistics, passed the request on to Frommer, who ended up meeting with Cameron and landing the job. "It's probably the most exciting thing that's ever happened to me," Frommer said. 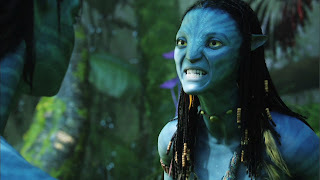 "From an acting standpoint, the hard part was speaking English with a Na'vi accent," says Cameron, "Zoe Saldana had the most lines, so we let her create the accent, and then everybody had to match her." Well, I give Zoe major props, because Na'vi is not exactly an easy language to learn. But if you're interested, like I am, you definatley want to go to Learnnavi.org. There's all sorts of great downloads there that can help you. For kicks, I'm going to show a few sample phrases I got from the Na'vi pocketguide. Kaltxi ngaru lu fpom srak? I apologize for this moron. My nose is full of his alien smell! Fun Trivia: Did you know, the Na'vi do not have a word for "lie." It is a completely alien concept to them. Ke lu kawtu a nulnivew oe pohu tireapivängkxo äo Vitrautral. If you want a swear word, though, you could say "Pxasìk." It means, "Screw it! No way!" Well, OK, that's a little lame. Better, maybe: Oeyä ikran slivu nga, tsakrr oeng 'awsiteng mivakto. 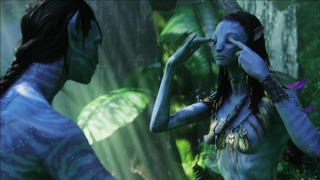 Here's a neat link from the Learn Na'vi Wiki that has pretty much all of the Na'vi lines from the movie translated (even the ones that weren't subtitled) and explained. Sure answered a lot of questions for me!